Not only has Marietta College been a beacon for higher education since gaining its charter in 1835, it has grown into a major economic driver for the region. During the 2017 fiscal year, the College had a $55 million overall economic impact on Washington County, Ohio, and Wood County, West Virginia, based on a recent study conducted by Ohio University’s Voinovich School of Leadership and Public Affairs last year. Researchers found that the College’s direct impact reached nearly $33.3 million from June 30, 2017, until July 1, 2017. 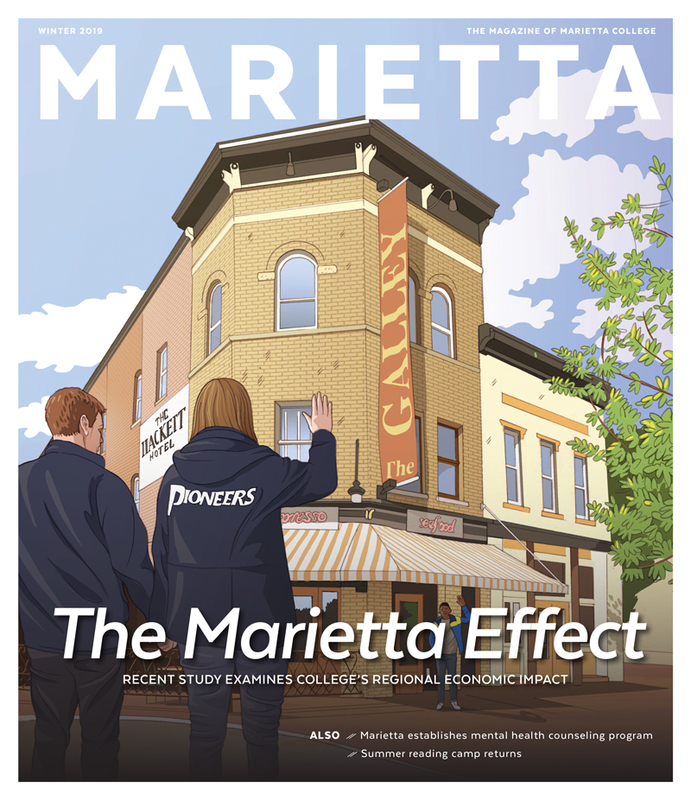 This edition of Marietta Magazine looks at how the College helps boost the local economy through student, employee and alumni spending, and through its day-to-day operations — from construction projects to the beautiful banners that adorn campus. Also in this issue, readers are introduced to one of the captains of the women’s lacrosse team, as well as two of men’s basketball coach Jon VanderWal’s biggest fans — his parents. The winter edition is packed with a variety of stories of students, alumni and faculty. 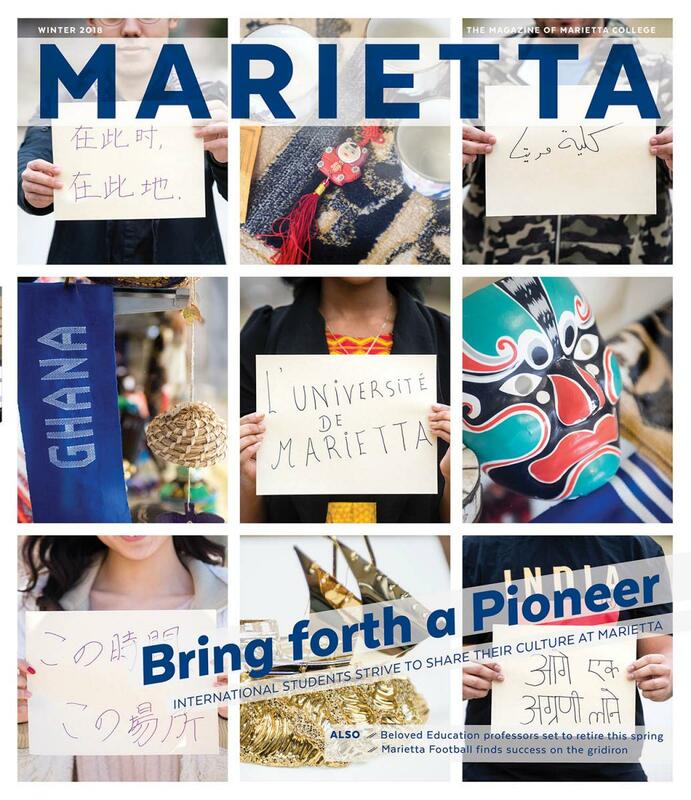 We invite you to share your Pioneer stories, class notes or letters to the editor with us by emailing marketing@marietta.edu. For many generations, young adults choose Marietta College as the place to receive a quality liberal arts education. What they may not have realized was that the moment they matriculated to Marietta, they joined a community of Pioneers — past, present and future — for life. Regardless of when they graduate, members of The Long Blue Line share memories of a very special college that became their second home. 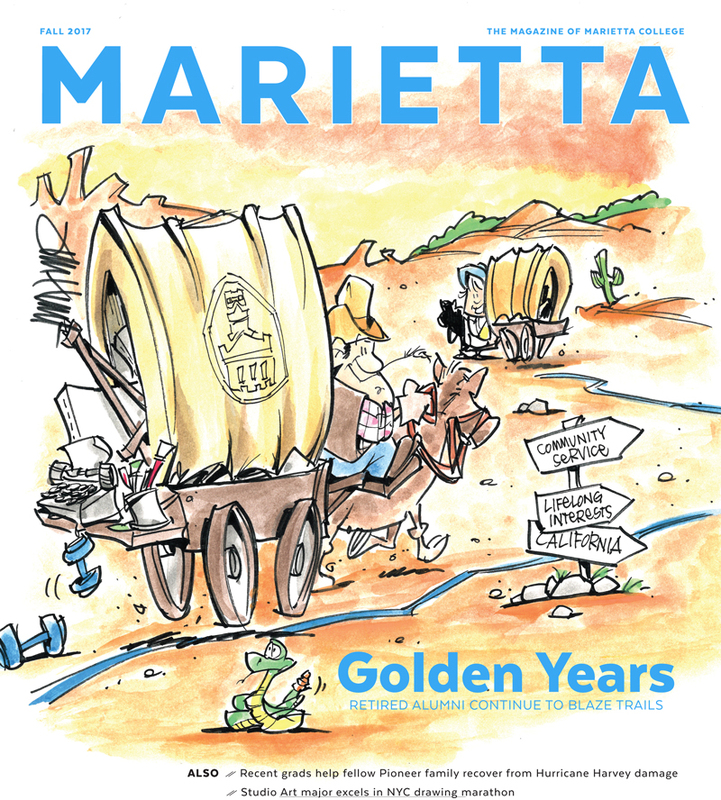 This edition of Marietta Magazine celebrates the power of The Long Blue Line and how alumni find ways to reconnect with each other and their alma mater to rekindle old friendships, make new ones and help the newest Pioneers find their footing after graduation. 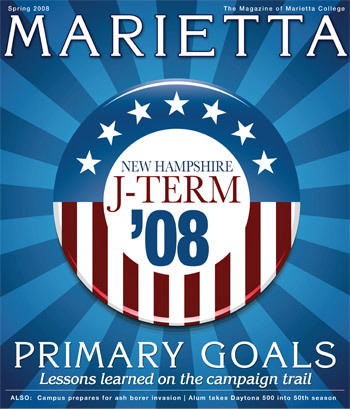 This issue also highlights Marietta’s revamped General Education Curriculum, which strengthens the focus on the liberal arts for every major throughout all four years of a student’s undergraduate education. As always, if you have an exciting story to share or would like to submit a class note for future publications, please send us an email at marketing@marietta.edu. Imran Syed ’20 and his family worked very hard to give him the opportunity to go to college. So when it came time to decide where he would study, he chose a place that would help him achieve his dream of becoming an engineer and give him a safe, quality environment in which to study. Though leaving home to attend college is seen as a rite of passage into adulthood, Syed’s story is a shining example of how dedicated Marietta’s students are to become Pioneers. Not only was he just 17 years old when he arrived for his freshman year, Syed was also the only student from India to do so. There are 170 international students currently earning their degrees at Marietta College. They hail from China, Kuwait, Ghana, the Democratic Republic of Congo, Saudi Arabia, England, Japan and India. In this issue of Marietta, The Magazine of Marietta College, a handful of Marietta’s international students tell the story of how they chose to study at this small, liberal arts college in Ohio, and how they plan to use their education to achieve their dreams. This edition also charts the emergence of Marietta football, and pays honor to Professors Dottie Erb and Carole Hancock as they prepare to retire from the College. 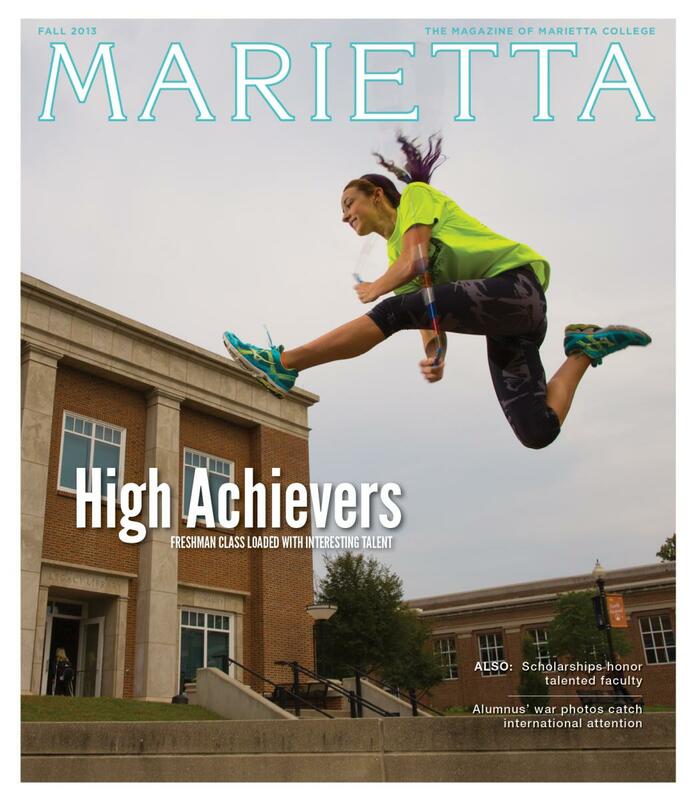 As always, if you have an exciting story to share or would like to submit a class note for future publications, send us an email at marketing@marietta.edu. 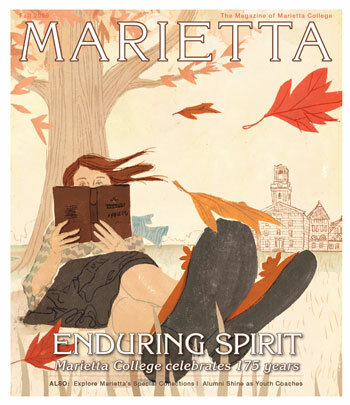 Autumn is in the air — which means your copy of Marietta, The Magazine of Marietta College is also in the mail. From cover to cover, this edition is packed with interesting stories about alumni, current students and faculty. 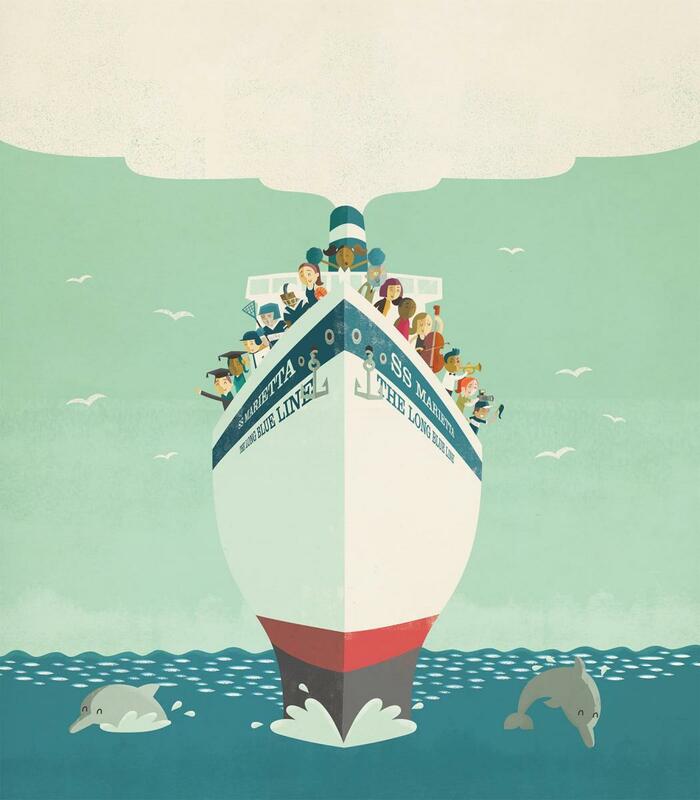 The main feature focuses on a few Golden Pioneers who continue to discover new passions after retiring from their careers. You’ll also read about recent alumni who pitched in over the long Labor Day weekend to help a fellow grad’s family clean up their home after Hurricane Harvey damaged it in August. Additionally, the magazine provides an update from campus on enrollment numbers and how generous our alumni and friends have been in helping to support the transformational education that Marietta College provides. As always, we invite our alumni and friends to share class notes updates or story ideas for future publication, and hope you take a few moments from your busy day to enjoy reading this latest edition. Dance, music, art and theatre were front and center during an all-day event in downtown Marietta this spring. Music students spent months working with the Music Associate Professor Marshall Kimball and McDonough Center’s Leader-in-Residence Donna Collins to book acts and performance venues, line up participating food trucks, and collaborate with the city in preparation for the Brick Street Arts Bash. The one-day festival highlighted the talent of local and regional artists, and provided a free cultural event to the community, showing the importance of having access to the arts, regardless of age. 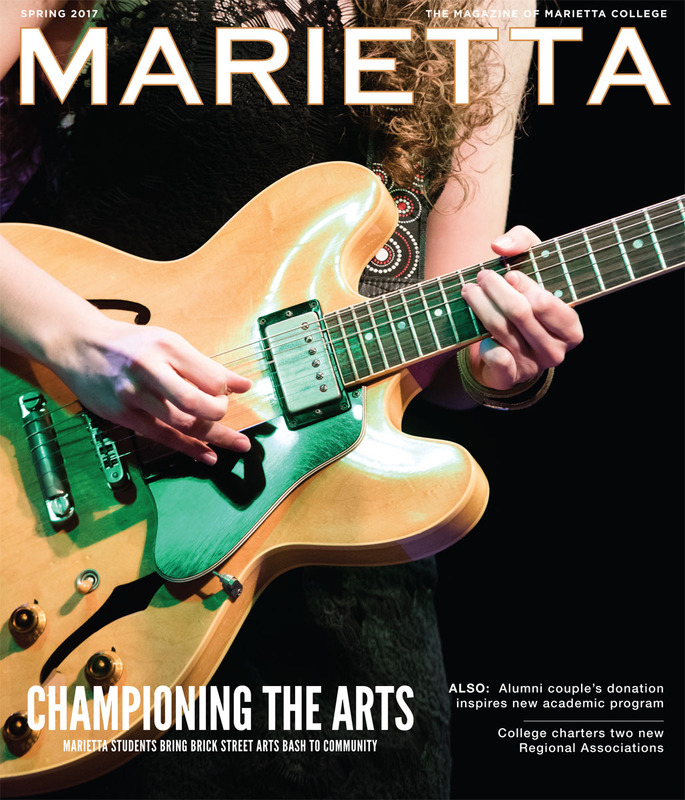 The arts are front and center in this edition of Marietta, The Magazine of Marietta College, which also includes a feature on how the College is working to create a new Music Therapy major, thanks to the generous donation of Don ’81 and Leslie Straub Ritter ’85. Readers can also learn about the College’s newest Regional Associations — the greater Columbus area and the Philadelphia area— which received charters this spring. This edition is loaded with stories about students, faculty and alumni. 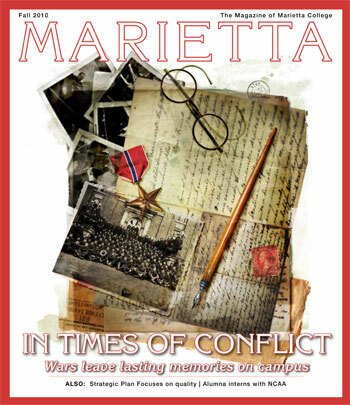 If you have a story or letter to the editor to share or would like to include a class note, please email mariettamagazine@marietta.edu — we always enjoy hearing from readers! The ability to communicate, solve problems and anticipate changes are many of the strengths that are developed when students undergo a liberal arts education. Those same qualities make for successful entrepreneurial-minded people. This edition of Marietta, The Magazine of Marietta College, highlights a group of alumni who chose to use their talents to pursue their own dreams of owning their own businesses, and what they’ve learned along the way. 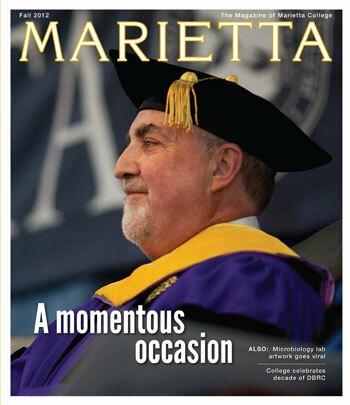 Also in this edition, readers can catch up on the important events that have happened on campus since the spring edition — namely, the inauguration of Dr. William N. Ruud as Marietta’s 19th President. We hope you enjoy the variety of stories that stem from being a part of Marietta College’s ever-impressive family. 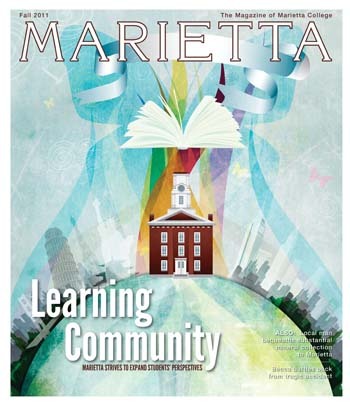 If you have a story or letter to the editor to share or would like to include a class note, please email mariettamagazine@marietta.edu — we always enjoy hearing from readers! Greek Life plays an important role at Marietta College. From creating lifelong friendships to reinforcing strong study habits, the eight chapters on campus have positively impacted the lives of so many current students and alumni. 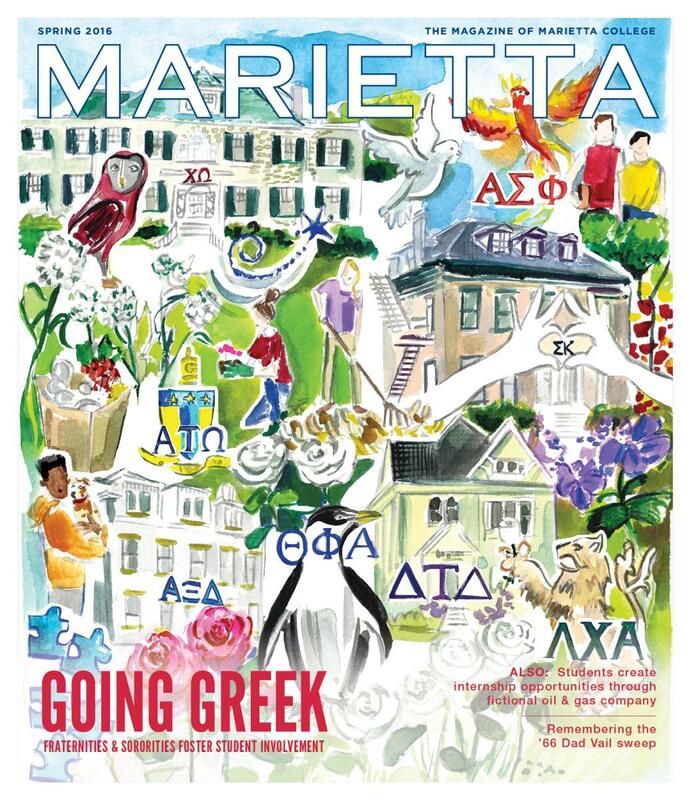 In this edition of Marietta, The Magazine of Marietta College, members from the eight chapters discuss the strengths and challenges that face their respective fraternity or sorority and why they’ll always cherish being a part of their organization. Other stories in this edition include the Ruby family’s tribute to their patriarch, the late Dr. Victor Ruby ’42, as well as learn about the College’s 19th president, Dr. William Ruud. This edition has plenty of interesting stories about students, staff and alumni. It’s no secret that enrollment numbers for small colleges have plummeted over the past five years. Adding to that problem is the ability to keep the students already enrolled. To give Marietta College the best possible position, a revamped First-Year Experience program has been rolled out for the 2015-16 academic year. Blending social activities, service projects, academic courses and time for reflection. The first-year students who arrived on campus began their time at Marietta College with a whitewater rafting adventure in West Virginia with their fellow classmates. More about the three-day trip and other aspects of the FYE program are detailed in the fall edition of Marietta Magazine. Additionally, the fall publication features the story of how Dr. Bill Bauer, Professor of Education, and his family turned the pain of losing his son, Grant ’12, to suicide into a way of helping others through an endowed fund that focuses on mental health and intellectual disabilities. The story also includes how an idea to do a random act of kindness in Grant’s name turned into a global event that involved thousands of people. 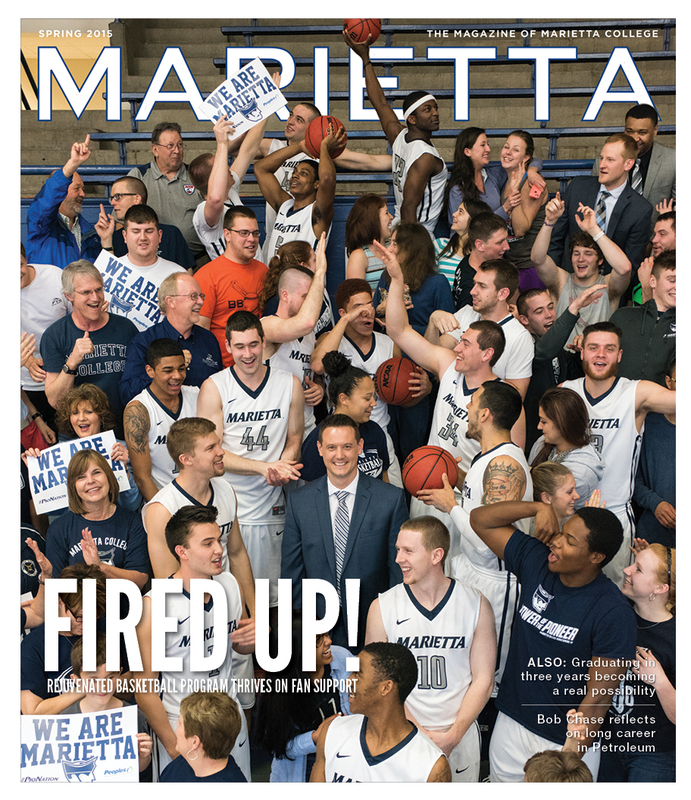 This edition of Marietta, The Magazine of Marietta College, features the events that culminated in the success of the 2014-15 season for men’s basketball — from the hiring of Head Coach Jon VanderWal in 2007 to the offense threat that this year’s team posed to their opponents. For the first time in program history, the team reached the NCAA Division III Elite 8, and solidified the Marietta community’s fandom. VanderWal and his players reflect on the magic of the season and express their gratitude for the fans that remained faithful as the team rebuilt what it meant to be a Pioneer. Also in this edition, news of a giant leaving the classroom after 38 years. Dr. Bob Chase has been the face of the Petroleum Engineering and Geology Department since 1970. He will remain in the Marietta community and help the new chair settle into the department and make the industry contacts that Chase has made during his tenure. He will also work to connect students with vital internships that will help them secure jobs post-graduation. There was a certain thrill on Interstate 77 when you finally reached the Exit 1 or Exit 6 signs — you knew you were just minutes away from so many things you loved … friends, your tiny dorm room dressed up just the way you liked it, that project you really didn’t want to do but would glean so much satisfaction from turning it in on time — what you would expect from any college campus. But the Marietta College experience spilled past the Fourth Street field, beyond Don Drumm and Parsons Field. Friendships were forged outside of the dorms and classrooms. Residents, shop owners and employees in the city were counted as friends; their specialty plates became your go-to comfort food, and the time you spent with them became special memories. 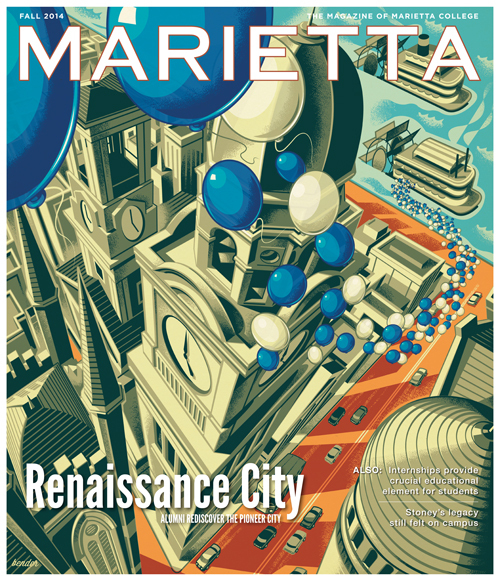 In this edition of Marietta Magazine, the cover story rummages into some of the more memorable places and tastes of the city of Marietta, and also highlights new or undiscovered hotspots you may not have gotten the chance to experience as a student but are encouraged to visit when you come back. The magazine also includes stories about student internships, Dr. Dwayne Stone’s estate giving his massive mineral and fossil collection to the College, and how John Parsons ’94 is making an impact on player safety as the Director of the NCAA’s Sports Science Institute. I hope you enjoy reading the variety of stories and the beautiful images featured in this edition! One of the selling points of Marietta College to prospective students is its location — in a historic small city nestled at the convergence of two beautiful rivers. For the most part, the close-knit community exists peacefully within the confines of this picturesque landscape. But every once in a while, the Ohio and the Muskingum take center stage. Ten years ago this fall, unrelenting rains from back-to-back hurricanes moving inland from the Atlantic Coast triggered a massive flood that snaked its way through campus, sent the majority of students home for a week and left a muddy, memorable mess. 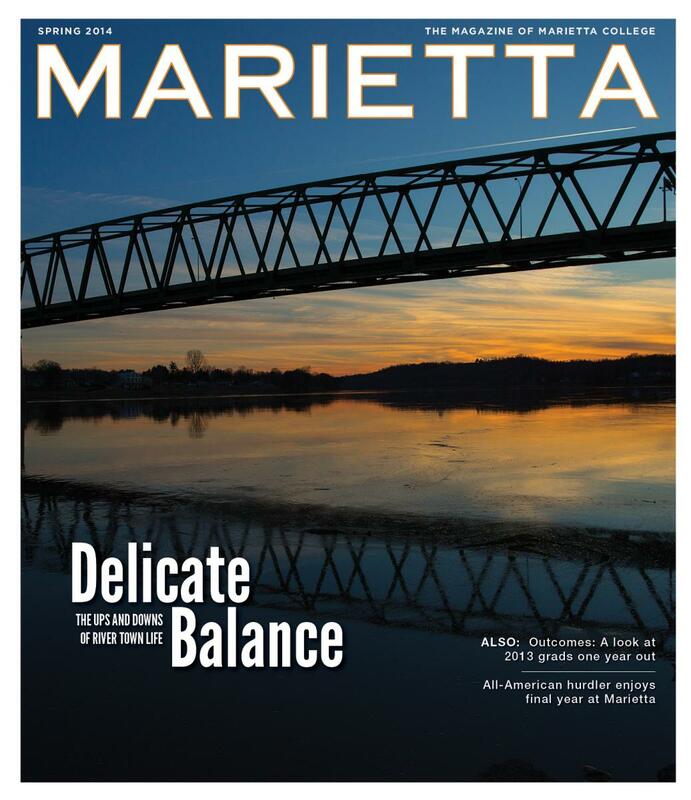 In this edition of Marietta, The Magazine of Marietta College, students, staff and faculty recall their experiences of the flood of 2004. Also featured are the impressive outcomes stories of a group of 2013 graduates who share what their lives are like since joining The Long Blue Line a year ago. There are many more features in the magazine — including one about an Army veteran who hopes to take the field this fall as a member of the Pioneers football team. Marietta College students, faculty and alumni have an endless supply of great stories to share. 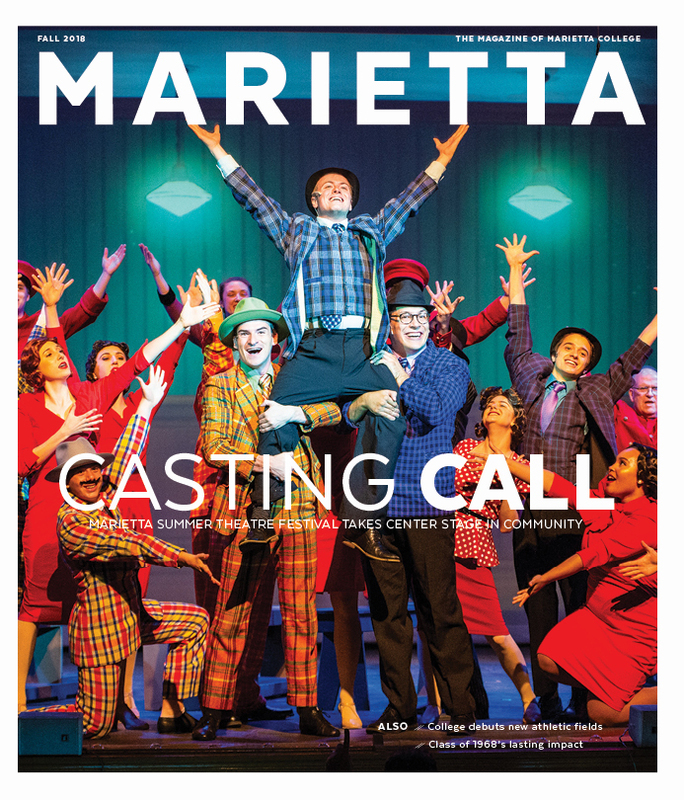 Let us know what you’ve been up to lately by submitting your class note to mariettamagazine@marietta.edu. We’d love to hear from you! On Thanksgiving Day, Morgan Armstrong ’17 won’t be sitting around the dinner table enjoying turkey, dressing and pumpkin pie; nor will she be watching football from the family’s Parkersburg, W.Va. living room couch. Actually, you’ll be able to see what the freshman is up to that day from pretty much any home in America if you’re tuned into the Macy’s Thanksgiving Day Parade. The world-class jump rope champion will be performing during the parade. It will be the second time that Morgan, who holds several national titles and 15 world titles in competitive jump roping, has performed during the special parade. Morgan is a member of the newest class of students at Marietta College, an outstanding group of freshmen who bring their special talents to campus. A few of these students are featured in the upcoming edition of Marietta, The Magazine of Marietta College, which should arrive in the mail in the coming weeks. Also in this edition, alumnus James Speed Hensinger ’68 shares stunning photographs he took during her time as a soldier in the Vietnam War, as well as a first-person account that gives the background story to those shots. His photos, which recently became public, are garnering a great deal of international media attention for their visual impact and quality. In addition, the Developments section highlights how generous gifts in the name of faculty tug on the heartstrings of our beloved Marietta professors and lessen the financial burden facing today’s crop of talented students. All Scholars Day 2013 highlighted the research and artistic projects of hundreds of students, giving them opportunities to discuss their work with members of the community representing a broad range of majors and departments at Marietta. 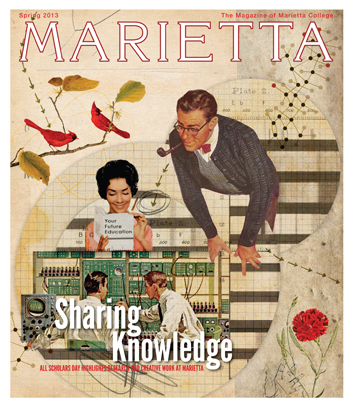 This edition of Marietta, The Magazine of Marietta College showcases three of those works and recognizes the importance of student-faculty collaborative research projects. By engaging in serious research, students are encouraged to take their education a step beyond the classroom to better understand how their knowledge can be applied in a real-world setting. In the magazine, Reggie Sims ’75 pays tribute to two very special alumnae who died last year. Dr. Barbara Diggs Lyles ’51, the first African American woman to graduate from Marietta, and Amanda Newhouse Carnie ’72, the first African American Homecoming Queen at Marietta, were courageous, intelligent and talented women who marched into uncharted territory and excelled in their individual efforts. As you read through the Class Notes section, please take the opportunity to send in an update and photo to share with your fellow alumni. We’d love to hear what you’ve been up to since graduation! Campus was in full celebration mode during the second weekend of October. Not only was it the start of the 2012 Homecoming Weekend, which welcomed hundreds of alumni and guests to campus, but it was also the moment that the College officially welcomed Dr. Joseph W. Bruno into the Marietta family. 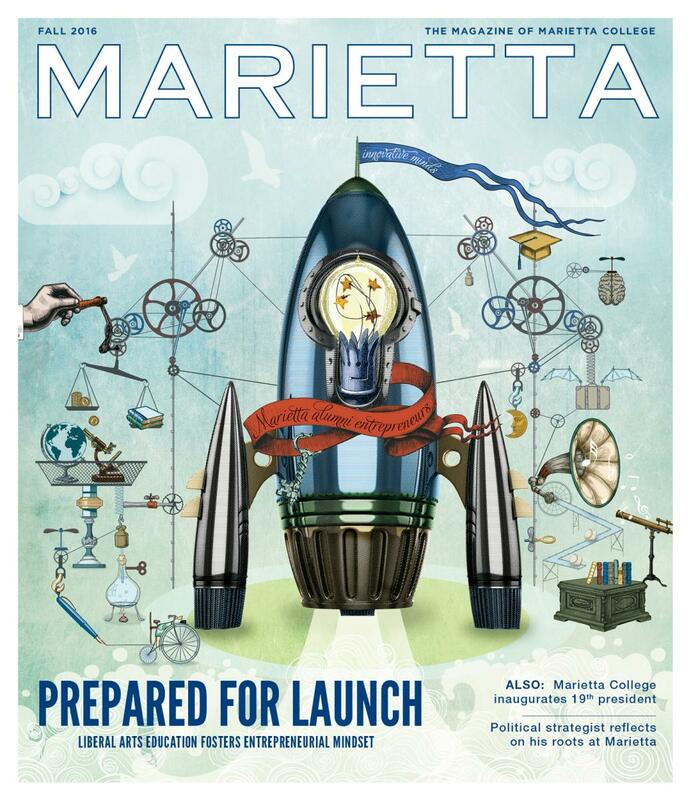 In the latest edition of Marietta, The Magazine of Marietta College, you can catch up on festivities that surrounded this historic event, which took place during Homecoming Weekend 2012. Also in this edition, learn about the impact the Dyson Baudo Recreation Center has had on campus since its completion a decade ago and learn about a growing tradition in Dr. Steven Spilatro's microbiology class. Don't forget, as you read through the Class Notes section, to send in an update or a story idea. We'd love to hear from you! Both served Marietta College beyond expectations, leaving last impressions on current students and alumni alike. This summer, Dr. Jean A. Scott will retire from Marietta after leading the College for 12 years. In just a few weeks, just as construction winds down on the new residence hall, Harrison Hall, demolition crews will begin dismantling Parsons, which has housed students since 1961. In the opening pages of this edition of Marietta Magazine, we pay tribute to some of the moments and programs that were ushered in when the Board of Trustees in 1999 made the decision to select Dr. Scott as the College's 17th president. Starting her tenure in the summer of 2000, Dr. Scott helped to shape initiatives that led the College out of trouble times and onto more prosperous paths. This edition also features her parting message to readers. Since the start of the construction of Harrison Hall, which will welcome its first residents this fall, alumni have been sending in their reflections of Parsons Hall, which is set for razing in just a few weeks. Parsons has become an indelible fixture in the memories of college life for thousands of alumni, some of whom share their personal stories and photographs in this edition. Another feature in the magazine shows how the College's 18th president, Dr. Joe Bruno, and his wife, Diane, prepare to leave their busy lives in Connecticut to begin a new journey at Marietta. Colleagues at Wesleyan University and KardasLarson, LLC, former students and lifelong neighbors and friends share their stories of the Brunos, bidding them farewell while sending their warmest wishes for the dynamic couple in their new roles. The magazine also features a story of rising sophomore Nikki Morrone '15, a visually-impaired studio art major who is taking the department by storm; the rise of Marietta's women's basketball program; and a feature about alumni couple Jessica Tobin'02 and Ryan Korner '01 teaching their children about the value of philanthropy. As one of the top liberal arts colleges in the Midwest, Marietta College prides itself on its ability to prepare students for the ever-changing workplace and community. 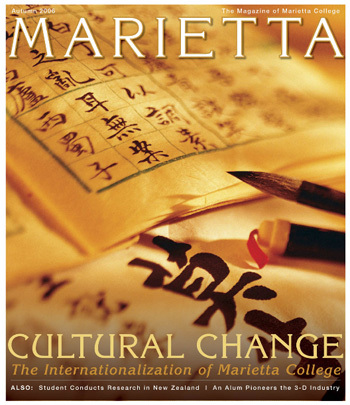 In this edition of Marietta, The Magazine of Marietta College, you will learn about the new Office for Diversity and Inclusion, as well as meet the new vice president, Dr. Richard Danford, whose role it is to identify and develop programs that allow the College to better recruit and retain international and minority students. Today's working environment demands professionals who are able to adapt to diverse fields and work with an array of people from various backgrounds and cultures. Because Marietta recognizes the value of being exposed to such dynamic environments, it's important to attract a broader range of backgrounds to campus, which means recruiting more minority students, faculty and staff. At the same time, the College must ensure the resources are available to traditionally underserved students so their dreams of successfully pursuing a higher education become a reality. Also in the magazine, you'll read about the strength and perseverance of alumna Rebecca Holzworth '10, who was critically injured this year in a car accident, and how her longtime boyfriend, Chad Walker '10, has remained her No. 1 supporter throughout her recovery. Glancing ahead to next spring, when the next edition of the magazine will hit the mail, we are asking alumni to send in their personal stories and, if possible, photographs of their memories of Parsons Hall, which is scheduled to be razed once the new residence hall is completed next fall. Marietta College is on the brink of a new era! 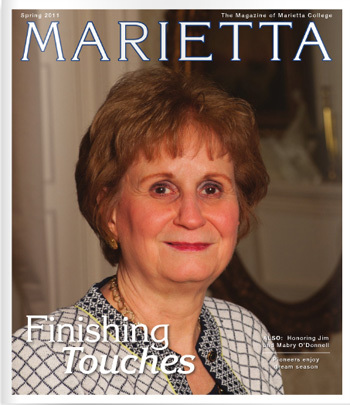 In this edition of Marietta, The Magazine of Marietta College, you'll read about President Jean Scott's retirement plans after the 2011-12 academic year and how she reflects on her tenure as the College's 17th and only woman president. The magazine also commemorates the impact that Drs. Jim and Mabry O'Donnell have had on the quality of education offered at Marietta and on the lives of hundreds of students, staff and faculty, past and present. Having taught at Marietta since 1969, the O'Donnells prepare for the next stages of their lives as Emeriti Professors. With campus still celebrating the Pioneer men reaching the Sweet Sixteen this winter, readers can also enjoy getting a back story behind the most successful Men's Basketball season in the College's history. Take a moment to catch up with what's been happening in the lives of your fellow alumni as well as the news on campus. Since the American Civil War, members of the Marietta College community have offered their services to aid in the nation's cause. Among the many interesting stories that you'll find in the Fall 2010 edition of Marietta, The Magazine of Marietta College is a feature that recognizes the sacrifices that generations of students, faculty and staff have made to fulfill their patriotic duty. A few Marietta College graduates reflect in the feature article on their lives at college before, during and after the country was involved in military conflicts and current students who recently left the battlefields in the Middle East talk about adjusting to life on campus today. Inside this edition, you'll also read about the College's newest strategic plan, Focused on Distinction, and about students who are beginning to make their way into their chosen industries by way of completing summer internships. 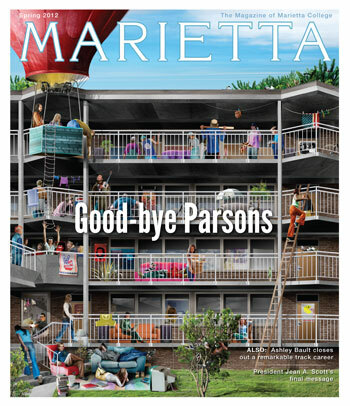 There are plenty of interesting stories in this edition so take a moment to catch up on what's happening at Marietta. 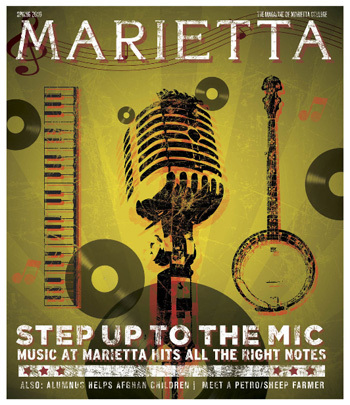 There's music in the air…at Marietta College. This edition looks at Marietta's academic music program as well as the many ensembles and choirs that touch every department on campus. It also features Steven Moore '13, the 2008 National Banjo Champion who happens to be a biochemistry major at Marietta College. Other interesting features in the magazine include a story about the captains of the 1974-75 basketball team reminiscing about their winning season, a touching article about U.S. Air Force Maj. John Matthews '89, who reached out to his alma mater while stationed in Afghanistan to ask for help in supplying the local children with educational material, and a story about a mother-daughter team, Jennifer'89 and Lauren Frank, who chose to write a book the helps other children cope with a cancer diagnosis. On Feb. 14, 1835, the state of Ohio granted a charter to Marietta College to confer undergraduate degrees. For the coming year, the College is in celebration mode as the start of the fall semester marks the 175th anniversary of Marietta's charter. This edition explores what makes a liberal arts education from Marietta College timeless and how leadership is consistently examining ways to maintain the level of excellence that has been associated with Marietta College, just as Erwin Tower has been to campus. Readers can also learn about 1994 alumna Michele Hodge Stallings' journey from Marietta College to being one of the top educators at an experimental charter school in rural North Carolina. Earlier this year, the College celebrated the opening of the Anderson Hancock Planetarium. 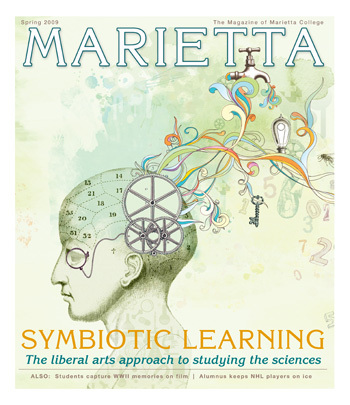 This edition takes a look at how Marietta prepares students majoring in the various branches of science to be lifelong learners in the various disciplines of science and how the liberal arts base to the education helps to prepare them for the ever-changing world of work. The magazine also gives readers a glimpse into the life of Mike Eisenberg '09, a former Pioneer baseball standout who had a stint in the minor leagues but who is currently pursing a career in filmmaking. Another exciting story is about an International Leadership Studies major who is pursuing a Teaching English as a Foreign Language Certificate. Emily Davis '11 hopes to travel to disadvantaged countries to help young people learn a language that will open many doors for them in the future. 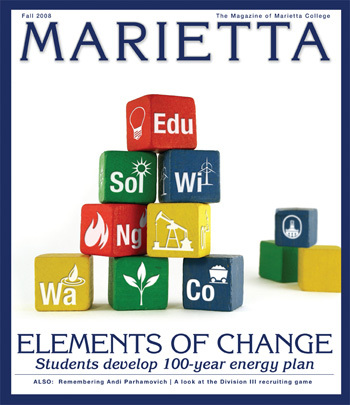 The fall edition of Marietta, The Magazine of Marietta College sets its sights on the energy crisis and how a team of students, under the guidance of Ken Henning '69, a veteran of the oil exploration industry, examines the world's best energy practices for the next 100 years. Without the aid of athletic scholarships or big recruiting budgets, Marietta College's coaching staff must rely on attracting student-athletes who are interested in gaining a liberal arts education first, and playing a sport second. 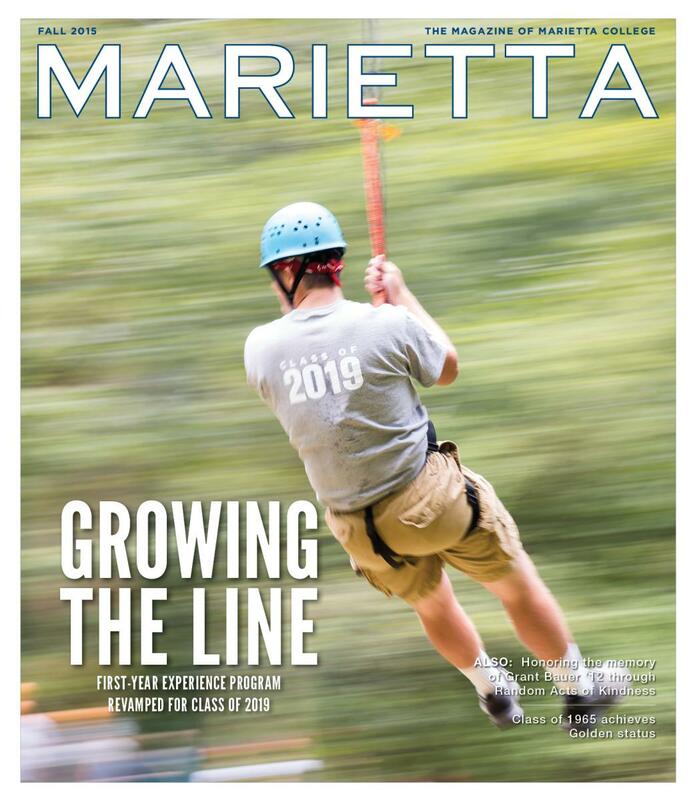 The magazine takes an interesting look at how Marietta coaches reach out to potential student athletes and what typically draws them in to play for the Pioneers. It wasn't your typical college class. While most students enjoyed Winter Break, more than a dozen of Dr. Jacqueline DeLaat's students interned with four major U.S. presidential campaigns in New Hampshire during the College's final J-Term course. The 13 students, mostly political science majors, stumped for presidential hopefuls Barack Obama, Hillary Clinton, John Edwards and Rudy Giuliani during the Granite State's primary election season. From knocking on doors in freezing temps to corralling the media during a candidate meet-and-greet, read about how Marietta's students learned about the pressures facing political advisors during heated races in this edition of Marietta, The Magazine of Marietta College. Also in the magazine are stories about the new Director of Athletics, Larry Hiser, the invasion of the emerald ash borer, and a feature on Harrison Potter '08, a math and physics major who earned both the McCoy and the Rickey scholarships. This scholastic standout is also driven to excel on the course as a competitive cross country and track & field runner. 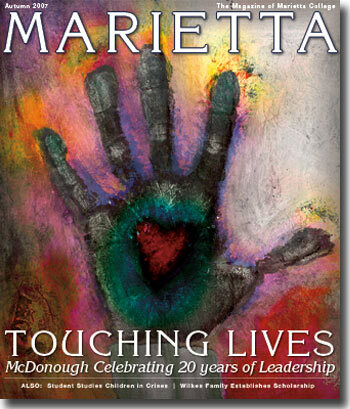 This edition of Marietta, The Magazine of Marietta College focuses on the impact that the McDonough Center for Leadership and Business has had on the world through its scholars and their influences. Since the late Alma McDonough gave a multi-million dollar gift 20 years ago in honor of her late husband Bernard P. McDonough, the center has educated students on how to "give back the gift." In addition to the McDonough stories, the magazine also introduces the new men's and women's basketball coaches —Jon VanderWal and Jill Meiring —and features a first-person narrative by McCoy Associate Professor of History, Dr. Matt Young, about how his experiences grading AP History exams for seven straight days shed light on the fact that today's American students have very little connection to their own history. Since receiving its charter in 1835, Marietta College has provided a quality liberal arts education to generations of students. 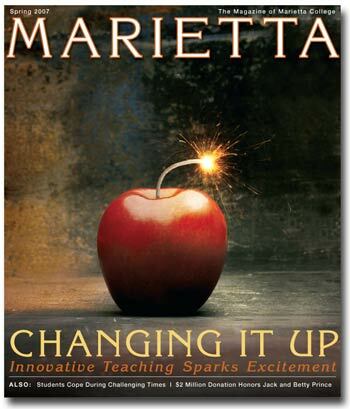 With the technological advances such as laptop computers, smart phones and wireless Internet access readily available to students, Marietta's professors continue to employ innovative approaches to educating the next generation of movers and shakers. The main feature in this edition showcases the truly inspired talent of the faculty and how the Pedagogy Committee encourages professors to develop and deliver teaching approaches and courses that challenge every student to think outside of the box. Another interesting story in the magazine is about an alumni couple who helped complete the fundraising efforts for the Legacy Library project. One of the great professors in Marietta's history, Dr. Jack Prince, and his late wife Betty, are being honored by one of Dr. Prince's former students, Eric Dobkin '64 and his wife Barbara Berman Dobkin '65, who donated $2 million to the College to support the Legacy Library project. The gift will create the Jack E. and Betty O. Prince Forum in the new library. The premiere edition of Marietta, The Magazine of Marietta College spotlights how the College prepares students to live and work in the global society. One of the College's tenets is to foster internationalization. Among the many interesting features in Marietta's new alumni publication, you'll read about how students are encouraged to learn about other cultures by studying abroad and how the College is attracting an increased population of international students. Also in this edition, the architects at Burgess & Niple, Inc., give readers a sneak peek into what the proposed Legacy Library will look like on campus and how the space will positively impact the College.